Martin Jones talks about his time at the Royal Academy of Music, the renowned Italian teacher Guido Agosti, his most admired pianist and his Nimbus 75th Birthday box set. 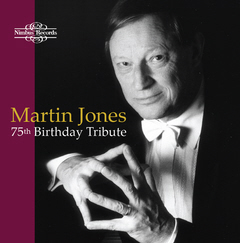 To celebrate his 75th year, Martin Jones will be recording a series of performances for the YouTube channel, Nimbus Records TV. Composers from Felix Mendelssohn to Franz Reizenstein will feature on the monthly video series. In the winter of 1979, just a few months after joining Nimbus Records and fresh out of Music College, I recall very clearly sitting in the control room, surrounded by boxes of analogue tapes containing the complete piano works of Mendelssohn played by Martin Jones. Nimbus founders, Numa Labinsky, Michael and Gerald Reynolds had, in the previous days, played me Martin’s unreleased recordings of the Variations Serieuses and Rachmaninoff’s Corelli Variations, and I was keen to discover if this incredibly fluent, muscular playing was typical of all his work. There was no disappointment; everything confirmed that here was a special talent, and a keyboard titan. At that date very few of the Mendelssohn recordings had been edited, despite having been made at various intervals over the previous nine years. Nimbus had moved from its Birmingham base in 1975 and was now preoccupied developing an LP pressing business that would enable it to release its own recordings. With nothing to lose, and no experience to give me pause for doubt, I offered to prepare the masters for the Mendelssohn, if someone would spare the time to show me how to use a razor blade. So it was that a few weeks later I phoned Martin, and told him that the Mendelssohn was done and he should come to Monmouth to listen. He probably didn’t believe me; after such a long delay he must have thought that ship had sailed. In fact the eventual release of the complete Mendelssohn would not happen until 1986 and on CD rather than LP. Nonetheless the flame was rekindled, and 35 years on from that phone call (45 counting from Martin’s first recording), we can look back over a musical partnership that is one of the cornerstones of the Nimbus catalogue. In addition to his contributions to the repertoire Martin has always been our ‘go-to’ performer for microphone tests and experiments. He helped with selection of new Steinway ‘Ds’ in 1995 and 2012, he has played for hours on end while we put new microphones through their trials, and when we assessed the acoustic properties of the new concert-hall at Wyastone Leys. He was the first person to make videos for Nimbus, and, as part of his birthday year, will initiate a video library of performances on-line. Martin has been witness to every step of Nimbus’s progress, and continues to be there to lend his support. To celebrate, Nimbus Records have released a 4 CD box set of his best work at Nimbus. Including 30 composers and 5 hours 11 minutes of music for just £19.99. Click here to purchase your copy.